The Australian Convict Sites consists of a series of 11 sites that, in combination, express the key aspects of the Australian convict experience that are of outstanding universal value from the point of view of global history. 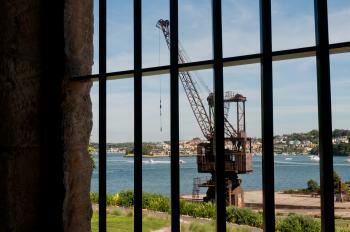 The 11 Convict Sites are mostly concentrated around Sydney and in Tasmania. While staying in Hobart, I visited the Port Arthur Historic Site. I did so on a daytour with a Grayline Bus, but in retrospect I would rather have hired a car so I could have visited some of the other Tasman convict sites too that are in the same area. One of the reviewers below calls Port Arthur “another Disneyland to entertain the mindless hordes”. I would not go that far, but it was a disappointing visit. The worst thing indeed are the crowds (a few hundred people were there at the same day as me), and the way they are herded through the site. There’s a “guided walk” included in your ticket, where you will not walk at all but only get to hear the basic story about Port Arthur standing in the wet grass with about 80 other people. I had paid extra for a tour of the Isle of the Dead. It’s in the bay in front of the historic buildings. Every entrance ticket will get you on the “cruise” through the bay where you can see a glimpse of Point Puer (where the young convicts were held) and the Isle of the Dead. The lucky visitors with the extra ticket could get off on the island for about 20 minutes, also on a tour presented by 2 very Australian guides (casual, going through the motions). What I did like at the site is the great variety in buildings that are left, or at least ruins of them, which gives a feel for how the convict community worked. I visited this WHS in January 2018. Of the 11 inscribed sites, 5 are scattered around Van Diemen's Land (Tasmania). Port Arthur and the Cascades Female Factory are the ones which attract most crowds as they cater for cruise ship tours and are among the closest to Hobart too. The highlight sites in Tasmania were the Brickendon and Woolmers Estates. While in Sydney we bought the Sydney Museums Pass, took a ferry to Cockatoo Island and then allowed around 2 hours to visit the Hyde Park Barracks Museum (just a short walk from the Sydney Opera House). Reading up prior to visiting this WHS will certainly help to better understand and appreciate its national importance and perhaps its OUV. During the 80 years between 1787 and 1868, some 166,000 men, women and children were transported to Australia as convicts. This mass shift of population or forced migration to Australia was part of a global phenomenon associated with the punishment of crime, in this instance controlled by the British government. This phenomenon, known as convictism, dates back to the early 17th century and occured in many parts of the world with Britain, France, Spain, Portugal, the Netherlands, Russia and Argentina all transporting criminals to locations across the globe. In Australia today there are more than 3000 convict sites remaining, all representing different aspects of convictism. However, the 11 inscribed sites are considered to be outstanding examples of convictism in Australia. They spread from Freemantle in the west to Norfolk Island in the east, from the middle of New South Wales to the depths of Tasmania's south. If I were to choose one site out of the 7 we visited to have a general overview of this WHS, I'd recommend visiting Hyde Park Barracks Museum. It is a unique museum and the building itself should be regarded as a museum of itself, directly related to its historic uses. Conditions in Britain led to a huge increase in the number of convicts sent to the colony after 1815. Built to hold 600 men, at times the Barracks housed up to 1300 people. Many traces of convict life remain. Inked into shipping ledgers and court records are minute personal details of men, women and children - their scars and tatoos, names and aliases, crimes and sentences. But there are also stories of opportunity, new lives and family. Most convicts served their sentences and blended into society as 'free' citizens. They carried out every type of task from skilled trades to labouring. They loaded ships and carted cargo, repaired tools and boats, cut and rolled logs, built dwellings and made clothing. Some were assigned to work for the government and slept in barracks and dorms like the one in Hyde Park (left photo) while others worked and lived in homesteads like the ones in Tasmania (right photo) under a private master or mistress. In 1849 the last convicts were removed from the barracks and incarcerated on Cockatoo Island in Sydney Harbour (easily reachable from Circular Quay Terminal). Convicts were sent to Tasmania until 1853 and the final convict vessel landed in Western Australia in 1868. Nowadays it is estimated that one in ten Australians has a convict ancestor. The Brickendon and Woolmers Estates were established in the early 1820s by the combined labours of convicts and their masters. These are easily reached by rental car from the Heritage Highway and are a very pleasant stopover to/from Cradle Mountain National Park. You can actually sleep in both of them and have the places for yourself before/after visiting hours (closed on Mondays). Even though I haven't visited Sweden's decorated farmhouses, from what I've seen/read online, the experience is rather similar with an idyllic agricultural/natural setting. For me it was a convenient stop to leave early in the morning to visit Cradle Mountain National Park, but also an interesting way to appreciate the two opposite kinds of relationships between the convicts and their masters - one of floggings and brutality, the other (here) of mutual tolerance and shared labour. Make sure to ask for a combined ticket if you intend to visit both sites. A new interpretation centre is being built near the Woolmers Estate and it is worth going for a walk from the pump house and windmills to the national rose garden. 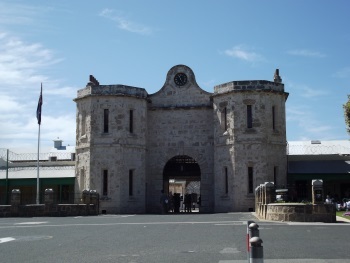 This year I visited the 11th of the locations included in this WHS, the Fremantle Prison. Fremantle is connected by rail to the city of Perth WA. The property is only accessible on a conducted tour, which takes you to the cells, kitchens, chapel, and exercise yards. I visited the site in February 2012. In particular, I visited Cockatoo Island, The Hyde Park Barracks, and the Old Government House. The Sydney area locations are pretty easy to visit, especially the barracks. View my complete review of the Australian Convict Sites on my website. The Australian Convict Sites are a testament to the significant role British prisoners made in shaping the country. Intrigued by Australian history, I visited two of these sites in June 2012: Hyde Park Barracks in Sydney, and Fremantle Prison, in Western Australia. Between 1819 and 1848 Hyde Park Barracks housed convicts who were deemed serviceable for government employment, and the excellent museum and dormitories tell their stories. The barracks also housed a courtroom to judge convict/employer disputes with prisoners working throughout the colony. In Western Australia, prisoners were used as free labor to build the colony -- and their prison. Although the guards had nicer quarters outside what is now called Fremantle Prison (see photo) the cell blocks were more austere. The museum at the entrance explained everyday prisoner life here well. At both sites a well-behaved convict worked for the day he or she received a Certificate of Freedom, allowing them to stay and settle in Australia or leave the colony; many did stay, leaving their imprint on early Australian life. I highly recommend a walk through history at at least one of the inscribed sites when in Australia. Logistics: Hyde Park Barracks is in the heart of Sydney, not far from the St. James railway station on the City Circle line. 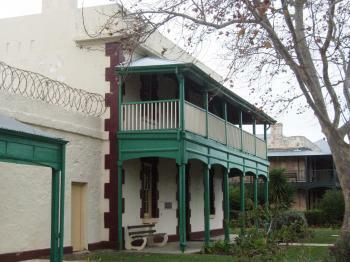 Fremantle Prison is in downtown Fremantle, a short walk from the city train station. It is at the convict sites in Van Diemens Land (Tasmania) that you hear the gory stories of murders, floggings and isolated incarceration of convicts at the hands of the British gaolers. Neither men, women nor children were exempt. Port Arthur convict site covers a huge area, but the first day I visited a cruise ship was in port and thousands of passengers were thronging the site. The following day however I had the whole site almost to myself. 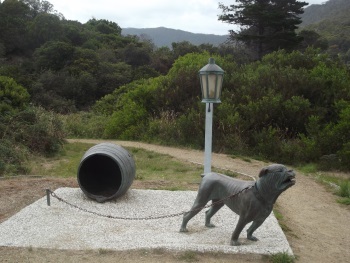 An interesting part of this site was the Dog Line, a line of chained mastiffs that guarded the site at the narrow isthmus of Eaglehawk Neck. The Coal mines were another site where convicts, especially children were forced to toil for hours in subterranean shafts and galleries. Darlington on Maria Island was home to repeat offenders where attempts at rehabilitation were made. The Woolmers and Brickendon Estates near Longford were both established as sheep stations on behalf of private owners using convict labour. The integrity of the Womens' Prison at Cascades in Hobart is very limited, and I find it hard to understand why this property made its way onto the WHS list. Especially as what I consider more deserving cases like Sarah Island in Macquarie Harbour and the Richmond Gaol were omitted. 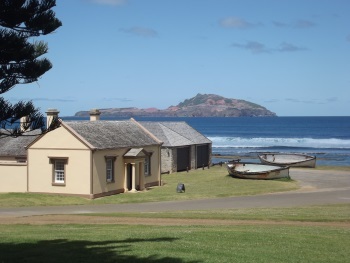 The New South Wales convict sites are at a variety of locations, but none as gruesome at those in Van Diemens Land (Tasmania) or Norfolk Island. The Hyde Park Barracks are easiliy accessible, being opposite the St James station. The Old Government House at Parramatta is accessible from Sydney's Circular Quay either by train of by ferry. A loop bus in Parramatta links the station, ferry wharf and the site in Parramatta Park. The buildings were constructed by convict labour under Governor Macquarie, and housed the first 10 Governors of the Colony. Cockatoo Island lies in the Parramatta River, and is accessible by ferry from either Circular Quay or Parramatta. 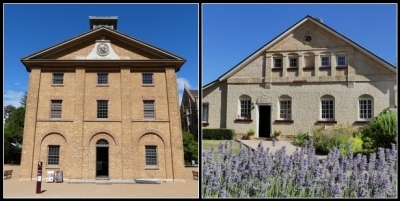 On the lower level of the site the convict buildings were later adapted for shipbuilding works, while on the upper level the convict accommodation remains unaltered. The Great North Road site is located on the north bank of the Hawkesbury River at Wisemans Ferry. It is accessible by the infrequent bus #663 from Windsor station, however inexpensive rental cars are available nearby. The road was carved from the sandstone cliff by convict labour, including masonry culverts beneath the road surface. A recent visit to the Kingston and Arthur's Vale area of Norfolk Island produced a number of memorable moments. On ship day, I watched the unloading of cargo by means of wooden lighters negotiating the surf between ship and shore, a method only a little changed from when HMS Sirius was wrecked in 1790 performing the same feat. The air in Norfolk is the clearest in the world outside Antarctica. At night the moon and Milky Way provided enough light to go walking at night in the old graveyard on Quality Row. That was until the moon went dark during an eclipse. For a while it became very spooky being amongst the tombstones in the dark. Finally made it to Cockatoo Island today. This site has a schizophrenic identity, charting both it's convict history and maritime history as well as playing a role as a major arts venue. The current, huge exhibition is dedicated to street art (including some BANKSY work) and was the highlight of the day. The trip was also helped by the warm temperature, lack of rain and refreshing breeze. Notwithstanding to maritime heritage, I have a few issues with the Convict and Heritage "Quarters". An audio guide could have potentially gone some way to resolving these, but alas, there was no one to dispense of one when I arrived. Otherwise the interpretation is rather poor. A number of buildings cannot be accessed (albeit that some restoration is currently under way). And the main convict quarters are little more that concrete shells with some of the original sandstone walls remaining. Even a couple rudimentary bunks with manikins in shackles would have helped. I appreciate that this a new inscription and a complex one, but a lot of work needs to be done to bring up the standard of presentation. This is especially so as the built form is not that inspiring. One of the highlights of our trip was visiting Port Arthur. Port Arthur is one of Australia's great tourism destinations. Every building, every feature of Port Arthur Historic Site has a story to tell. The Port Arthur Historic Site has over thirty buildings, ruins and restored period furnished homes set in 40 hectares of landscaped grounds. The Port Arthur penal settlement began life as a small timber station in 1830. Originally designed as a replacement for the recently closed timber camp at Birches Bay, Port Arthur quickly grew in importance within the penal system of the colonies. Port Arthur Convict Site has become another "Disneyland". It has become a money making venture, to entertain the mindless hordes that have escaped from their Televisions. If you want to experience true prostitution you should visit this site. Its a great pity another piece of World History has been stolen and degraded to serve a few peoples lust for some easy money. Sadly it is the way in every country. When I went to Tasmania for the first time in April 1997, I visited Port Arthur. It was almost one year after the massacre that claimed the lives of 35 people on site. A memorial was already built to remember those who had lost their lives. 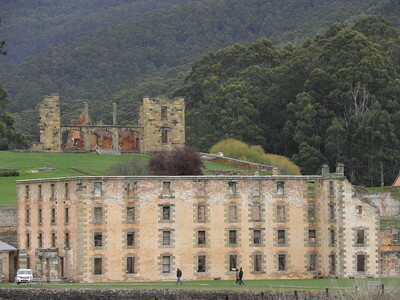 Port Arthur's penitentiary and other buildings were basically ruins due to bushfires and years of wear and tear. It is still picturesque with green rolling hills, colourful leaves (during that time of year), and clear water. I took the boat cruise around the Island of the Dead but found it a bit boring and the boat was quite crowded. However, there were lots of opportunities for taking pictures, not only of the ruins but also theh Tasmans Arch and Blow Hole. 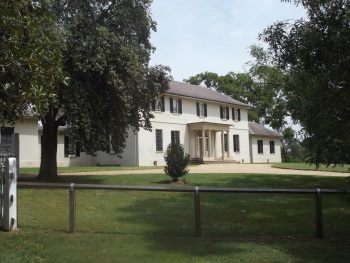 ICOMOS advised Referral to "Inscribe Brickendon and Woolmers Estates (site No 4) on the National Heritage List and rapidly schedule the necessary work for the conservation of the buildings at this site that are in a poor condition"
Georgian Architecture: Old Government House and Domain, Parramatta "The site is arranged around Government House and its gardens. It is a Georgian-style mansion with a central section and two asymmetrical wings erected some years later." English garden: Old Government House and Domain, Parramatta "The park includes ..... landscaped gardens in late 18th century English style"
Unfinished constructions: Old Great North Road - Finch's Line was abandoned prior to completion in 1829 due to it being too steep and the alternative route up Devines Hill was selected. Damaged by Landslide: Great North Road Slope failure resulted in collapse of the retaining wall and road structure of a major section of Devines Hill in 1857. The road was realigned with evidence of buttresses on the original alignment still clearly visible. Dependent territories: Norfolk Island (Kingston and Arthurs Vale Historic Area): "The island is part of the Commonwealth of Australia, but it enjoys a large degree of self-governance. Together with two neighbouring islands, it forms one of Australia's external territories." Shell Mounds (Middens): Old Government House - "shells from Aboriginal middens were used to strengthen household mortar"
Coal Mining: "Coal Mines Historic Site is also located on the Tasman Peninsula in Tasmania, on Norfolk Bay. This punishment station operated from 1833 to 1848, for the operation of a coal-mine. Coal extraction continued until the 1880s,....... The site includes ..... the four pitheads,"
Irrigation and drainage: Great North Road - significant drains and culverts were constructed as part of the road construction. Historical Graffiti: Great North Road - Graffiti from 1830s. "35 pieces, including many initials, arrow, ship, the word MAD DOG followed by 'spell it backwards'"
Vineyards: Darlington Probation Station. In the 1880s an entrepreneur called Diego Bernacchi tried to develop a wine industry on Maria Island. The foundations of the vineyard workers houses are within the inscribed area. Role of Women: "Cascades Female Factory is a female prison in southeast Tasmania, today on the western outskirts of Hobart....operated as a convict factory, exclusively employing females, between 1828 and 1856. Some 25,000 convicts passed through"